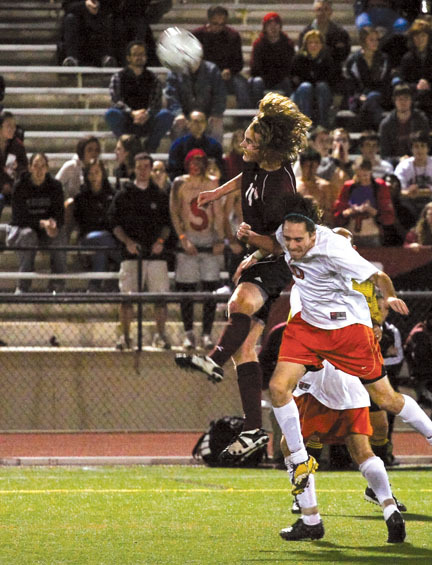 Men’s soccer player Micah Rose ’12 (above)and teammate Morgan Langley ’09 were named All-Centennial Conference First Team. 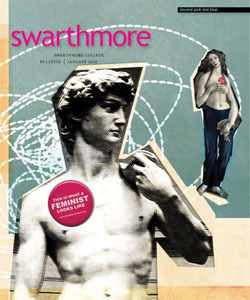 The 2009 fall season proved that it’s never been a better time to be a fan of Swarthmore athletics. The men’s soccer team excited the entire campus with a repeat run to the NCAA Division III Sweet 16, the volleyball team defied expectations with one of the best seasons in program history, and the women’s soccer team set a program record for victories in a season and captured its third-straight ECAC Championship. At the same time, fans, parents, and alumni from around the globe have been able to follow Garnet athletics as never before—thanks to the Garnet Sports Network live Web streaming, which attracted more than 7,000 viewers in its first season. 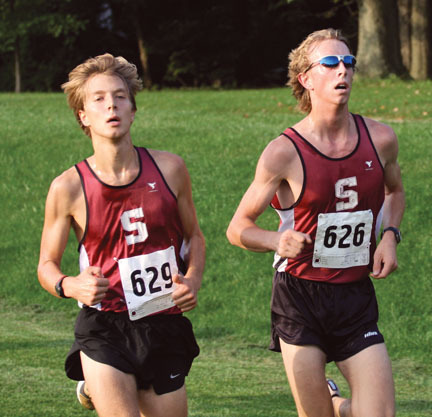 Freshmen led the pack in 2009, as newcomers continually paced a Garnet team that earned a sixth-place finish at the Centennial Conference championship meet. John McMinn ’13 emerged as the team’s breakthrough performer, as Swarthmore’s top finisher in five of six races, including a season-best 26:21 time in the historic Paul Short Run at Lehigh University. McMinn led the Garnet with a 21st-place finish (27:59.96) at the Centennial Championship meet, and Jacob Phillips ’13 finished with Swarthmore’s best time (26:35.1) at the NCAA Mideast Regional meet. Both McMinn and Phillips were named All-Region Newcomers for their stellar performances at the NCAA Mideast Regional meet. Despite missing most of the season due to injury, Melissa Frick ’12 made the most of her late-season return to the course by earning All-Region honors for her performance (23:09) at the NCAA Mideast Regional meet to close the season. Hannah Rose ’12 had a big year for the Garnet, earning All-Championship honors for her fourth-place finish (19:06) at the 28th annual Seven Sisters Championship from Mount Holyoke College and finishing a team-best 17th (24:27.43) at the Centennial Conference Championship meet—helping Swarthmore earn a fifth-place finish as a team. Lauren DeLuca ’10 took ninth (19:44) to also earn All-Championship honors at the Seven Sisters Championship, helping the team to a third-place team finish. In men’s cross country, freshmen John McMinn and Jacob Phillips (above, left to right) were both named All_Region Newcomers for their respective performances at the NCAA Mideast Regional Meet. A young squad comprising seven underclassmen had its ups and downs during the 2009 season but managed to equal the previous season’s five-game win total. Captain Joslyn Young ’10 led the Garnet, earning All-Centennial Conference honors for her efforts, which included four goals, two assists, and a team-leading .444 shooting percentage. First years Sophia Agathis ’13 and Katie Teleky ’13 provide hope for the future, with Agathis finishing third in the Centennial Conference with nine assists and Teleky leading the team with nine goals and 19 points. In another remarkable season, the Swarthmore men’s soccer team reached the NCAA Division III Sweet 16 for the second consecutive season, setting several program records and solidifying the Garnet as one of the top men’s soccer programs in the nation. Thanks to a 14-2-2 regular season and second-place finish in the Centennial Conference, the team earned an at-large berth in the NCAA Tournament and the right to host the first and second rounds on campus. The team did not disappoint the hundreds of boisterous Swarthmore fans at Clothier Field during the NCAA playoffs, defeating both U.S. Merchant Marine (2-1) and Hobart (2-1) in thrilling fashion to advance to the Sweet 16. The playoff run ended for Swarthmore in the next round, as Transylvania advanced past Swarthmore on penalty kicks (4-1), but it didn’t take away from one of the best seasons in men’s soccer history. In women’s cross country, Hannah Rose ’12 earned All-Championship honors. Notable record-breaking accomplishments for the 2009 team included wins over four nationally ranked opponents, the highest ranking (No. 3) in program history, and completing only the fourth unbeaten home schedule (9-0-1) in program history. It was also the first time Swarthmore was ranked nationally for the entire season. Junior Morgan Langley also re-wrote the record books, leading a potent Garnet offense—which finished with an impressive +35 goal differential—by scoring 14 goals, leading the Centennial and placing fourth on the College’s all-time mark for goals in a season. Langley was named first-team All-Centennial Conference, joining teammates Micah Rose ’12 (First Team), Brett McLarney ’12 (Second Team), and Gage Newman ’11 (Honorable Mention). The team also found success in the classroom, as seven players were named to the Centennial Conference Academic Honor Roll, while McLarney and David D’Annunzio ’12 were both named to the ESPN the Magazine Academic All-District II Team. 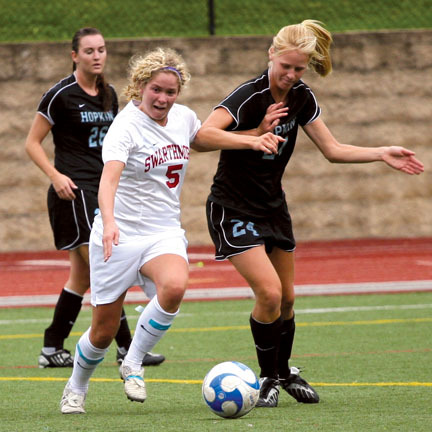 Alexa Ross ’13 (center) and five other members of the women’s soccer team earned All-Centennial honors. The women’s soccer team captured its third consecutive ECAC Championship, defeating Penn State–Behrend 1-0 in the championship game, further cementing its place as one of the premier soccer programs in the region. Head coach Todd Anckaitis saw the Garnet reach the Centennial Conference playoffs for the fourth consecutive year and set a program record for victories (16) in a single season. Six different members of the team—Julia Luongo ’10, Maggie DeLorme ’10, Megan Colombo ’11, Laura Bolger ’11, Marie Mutryn ’12, and Alexa Ross ’13—earned All-Centennial Conference honors, with Colombo and Luongo making the first team. Behind an offense that set a program record for goals in a single season (39) and a stingy defense, the Garnet captured first place at the season-opening Swat Kick Classic and defeated playoff teams from Albright, Dickinson, Eastern, and Elizabethtown. 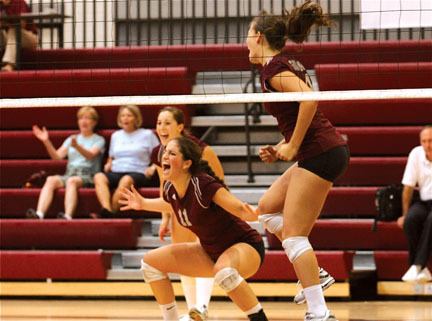 Genny Pezzola ’12 (top) was the first womens’ volleyball player to be named First-Team All-Centennial Conference, compiling one of the best statistical seasons in the program’s history. Despite being selected to finish ninth in the Centennial Conference preseason poll, the Swarthmore volleyball team surprised everyone, finishing with one of the best seasons in program history, earning 19 wins, and reaching the Centennial Conference playoffs for the first time since 2005. The remarkable season saw the Garnet reach many program firsts: its first Centennial Conference playoff victory (3-1 vs. Muhlenberg in front of a big, loud crowd at Tarble Pavilion), its first ECAC playoff berth, and the program’s first player to be named first-team All-Centennial Conference (Genny Pezzola ’12). Pezzola led the team with 404 kills—a new program record—440 digs, 3.88 kills per set, and 4.23 digs per set. She was also twice named Centennial Conference Performer of the Week (Sept. 15 and Oct. 6) and earned MVP honors at the Garnet Classic. Kat Montemurro ’13 joined Pezzola on the All-Centennial team, earning second-team honors after leading the Garnet in hitting percentage (2.78) and blocks (31). Harleigh Chwastyk, in her eighth year as head coach, was named the Centennial Conference Coach of the Year after guiding the Garnet to such a remarkable season.